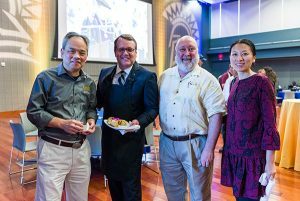 Thank you to those who stopped by the farewell reception in my honor on May 7. I was struck by the number of people who dropped in to spend a few moments with me. I appreciate President Mary Papazian and others who shared some heartfelt thoughts with the crowd before allowing me to offer my thanks to all those with whom I’ve worked. I am still realizing just how much I am going to miss all of you, even as I look forward to my new adventure in Colorado. I want to express again that it has been an extraordinary honor to serve San Jose State University. We are in our last stretch of the semester, with final exams under way and commencement in sight. I am especially looking forward to celebrating with our students on May 23-25, and it is bittersweet that this will be my last graduation season at San Jose State. Thank you to all the faculty and staff members who support our students, and propel them toward this momentous occasion. I hope to see many of you at the ceremonies next week. Through the Academic Spotlight newsletter, I have welcomed the opportunity to share with you campus and division priorities, to tell stories about faculty and staff, and to reflect on events I have participated in throughout the year. For this final newsletter of the year — and my final message as provost — I hope you will enjoy reading and watching recent news pieces that have featured members of our Spartan community. We have tremendous talent and experience in our ranks, and it is no surprise that regional, national and global media outlets turn to San Jose State. We hear from reporters who request an expert to speak on timely topics such as mudslides in Southern California, minimum wage increases or Women’s Marches. We have a robust roster of Faculty and Staff Experts who are prepared to provide a quick response on such issues as affordable housing, the evolution of technology, upcoming elections and many other subjects. Other times we receive media coverage about the research conducted by students and faculty such as a study on how the flu spreads that made the New York Times California Report (scroll to the bottom of the story), or events we host like the Institute for the Study of Sports, Society and Social Change Town Hall on Gender and Equity. We also hear from news outlets who just want to share the compelling stories of Spartans, such as the team of engineering students who displayed unique vehicles at the SV Auto Show. I am pleased to share with you some of the ways in which Spartans have been newsworthy in recent weeks. It is reassuring to know that when I am in Colorado, I will still be able to check in on San Jose State through the robust media coverage this university receives. Though we may be parting, I know that we all have wonderful journeys ahead of us and I wish you the best.